How can individuals contribute towards the needs of society? Why have traditional light bulbs been abolished by the EU? In Germany, as in many other European countries, conventional light bulbs are to be abolished. 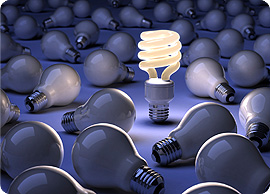 From 2009 to 2012 conventional light bulbs will vanish from shops in stages, starting with the most powerful ones. This task aims to provide students with opportunities to discover why the EU introduced this change whilst exploring relevant mathematical and scientific content.